Horsegram(Kulith) is supposed to be good for health during cold weather, more details here. I remember those days, while growing up, when I hated horsegram. I wouldn’t allow aayi make anything with them. But now, I cook with them frequently. I made these dosas few days ago. They came out delicious and crispy. Soak everything(except salt) in water for about 3-4 hrs. Grind to a smooth batter. Leave it in a warm place for about 6-7hrs or overnight. I spread some chutney powder on the dosa and fold them. They can be served with any chutney or sambar. What a coincidence! I made kulitha raman today as well. I used brown rice though. Amma makes idlis and polo’s using kulith very often. Haven’t made them since a while. Its a new recipe for me…Will give this a try. Dosa looks healthy and delicious. I bet the urad and chana give such a nice flavour- perfect-looking dosa! Kulith dosa is new to me. I like kulith in any form… thanks for sharing. I haven’t used kollu in my menu.. will try this once !! I tried making kulit dosa from the bater which was remaining after making kulith idli from your site and it turned crispy as well as tasty. I shall try this once……. Is Horsegram available in all desi stores? I tried in two stores and was not available. Is there any Gujarathi word to that? Please help! 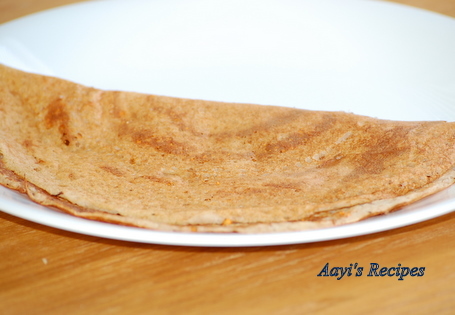 dosas are versatile, can be prepared with any lentil, flours..this sounds very healthy ! We do idly and rasam never tried dosa. looks delicious. Shilpa sorry to be off topic. I am looking for a konkani dry chutney my neighbor used to make when i was a kid. It had dalia [the chana dal looking think we put in chivda] and then it had tamarind i think and it was spicy [dried red chillies again a guess]. Would u know what its called and how to make it? Shilpa, I tried this and it was yummy..thanks for sharing the recipe..
One question, how long do you keep idli or dosa batter in the fridge? So far I have used it in one or one-and-a-half days. Have you tried keeping it a bit longer? say 4-5 days? I normally keep it max 3 days. I don’t prefer keeping more than that. You can freeze the idlis after steaming, that way they can be saved for longer time. Thanks for the quick reply. I’ll keep this in mind. Anyway, thanks again and have a great Sunday! I always make kadi by kulit. Nice recipe I will try this. Inever tried kulith fr dosa..only in idli. this seems pretty nice. will try. About your predicament on batter not fermenting, try using a teaspoon of sugar while grinding. Sugar enhances the fermenting process. You might need to keep the batter in a warm place in the kitchen. In Pune, India where I live, the batter takes all night and the early part of the morning to rise. But I know its perfectly done when its light and fluffy with million s of little bubbles. Add your salt now to it coz unlike sugar, salt holds back the fermentation. Where in heaven’s name do you get the time to grind all that masala separately for your dishes? I’m a working mom of a 18 mth old who loves cooking but its always a race against time. Thanks so much for sharing your recipes. Can this kulith dosa be made without adding the channa dal ? I am allergic to channa dal. Yes, just leave it out. I like to give my version of it very easy ,try and tell me. Soak 1cup horsegram and rice less than 1/4 cup overnight. Next day morning grind it coarse with less water and add finely chopped onion,coriander leaves,curry leaves and ginger. Then spread dosas little thick and cover,when cooked turn other side.,smells like omlet. I made these dosas yesterday, and I felt it was better than the normal dosas. Thank you so much for sharing this tasty and nutritious dosa recipe. you are truly an amazing cook..